A late night visit to the goodies in the refrigerator can make you gain some extra pounds. Want to have something that will satisfy your hunger and not drastically increase the calorie intake? Have a bowl of yogurt before bed. Eating yogurt at night snack will not make you feel full and gives you a good dose of nutrients and sleep-inducing amino acids such as tryptophan. So, having a serving of yogurt for dinner or at late at night may help you sleep better. To avoid the consumption of excess calories, you can opt for a bowl of non-fat yogurt. Here are some more reasons to eat yogurt before bed. As mentioned, yogurt contains tryptophan. It is an amino acid which helps produce sleep-inducing and relaxing chemicals called serotonin and melatonin. Yogurt promotes the production of these chemicals which have a calming effect on the brain to help you sleep well through the night. People with insomnia should try to eat yogurt before bed and make a note of changes in their sleep patterns. They can continue with it if they find it beneficial. Traditionally, our grandmas gave us a mug of warm milk before going to bed. Milk also contains sleep-inducing tryptophan, so people who suffer from insomnia drink it to get a good night’s sleep. However, those who are lactose intolerance cannot drink milk. The lactic acid bacteria in yogurt convert lactose to lactic acid, which reduces the amount of lactose in yogurt. So, most lactose-intolerant people can have yogurt in moderation. A good digestive system goes a long way in building and maintaining good health. Many of our health issues have a connection with our gut health, including immunity and thyroid issues. So, developing good gut health is essential. Probiotics are essentially gut bacteria or the normal flora of the intestine. They are present in the gut lining from birth and aid in the digestion process. Milk and milk products such as yogurt, kefir, and buttermilk are natural probiotic foods as they contain good live bacteria. Eating yogurt at bedtime reduces gastrointestinal symptoms. It is easy to digest and abundant in nutrients, making it a good bedtime snack. What you put in your body before bed and throughout the day affects your weight. Yogurt is a relatively low-calorie food to satisfy your late-night cravings. Eating yogurt before bed is healthy and will also not make you gain weight. But, you should also monitor what you eat during the day. Proteins help in lean muscle development. Yogurt is rich in proteins and having it before bed may help prevent muscle loss during sleep and keep them in good shape. Yogurt has good quality proteins with all the required amino acids. An eight-ounce serving of yogurt provides 11 grams of proteins. We know that tryptophan helps induce sleep. To enhance the production of tryptophan, you should combine proteins and complex carbohydrates. Having yogurt with carbohydrates clears amino acids from the blood and helps tryptophan reach the brain quickly and efficiently. However, you should be careful about eating yogurt before bed as not all yogurt may help you sleep. Yogurt that has high amounts of sugar can spike the blood sugar level and disrupt sleep. 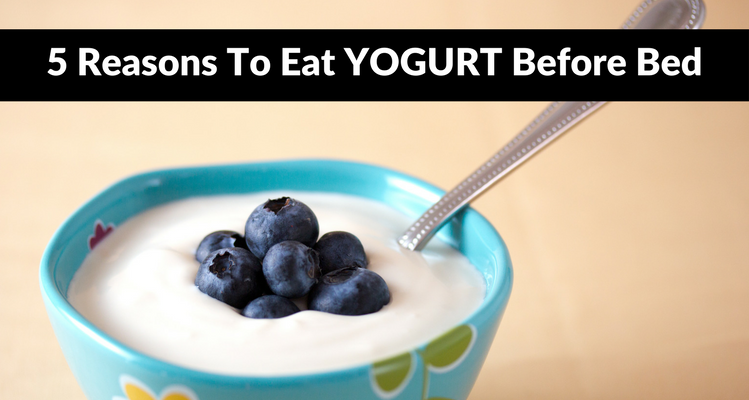 You should opt for plain yogurt or those varieties with a low sugar content. To make plain yogurt sweet, you can add naturally sweet foods such as berries or dried fruits. You can also have Greek yogurt for sleeping well. It is rich and thick and is usually made from sheep’s milk, but it can also be made using cow’s milk. Greek yogurt is creamy and comes in non-fat and full-fat varieties. Avoid consuming frozen yogurt before bed. It contains added sugar and artificial flavorings. It may also not contain probiotic culture like that in natural yogurt. A cup of plain yogurt made from whole milk is extremely nutritious and delicious. A one-cup serving equals to approximately 245 grams of yogurt. This serving size has about 8 grams of good quality protein, 11.5 grams of carbs in the form of lactose and galactose sugars, good fats such as omega-3 and omega-6 fatty acids, and saturated fat. It also contains numerous vitamins and minerals. Yogurt has vitamin A (retinol and beta-carotene), B vitamins (riboflavin, thiamin, B12, B6, B9 or folate, and pantothenic acid). It also contains trace amounts of vitamins C, K, and E.
The minerals in yogurt include calcium, magnesium, phosphorus, potassium, zinc, selenium, and other trace minerals. The same serving size also contains 31.9 milligrams of cholesterol. Try these other snacks before bed to help you get a good night’s sleep. Almond butter contains good amounts of proteins and magnesium. Magnesium deficiency can cause muscle cramps and insomnia. Having whole grain toast with almond butter will satisfy your hunger and boost your magnesium intake. A banana blended with low-fat milk boosts calcium and vitamin D intake. Deficiency of nutrients may deprive you of sleep. Bananas are a good source of magnesium, tryptophan, and vitamin B6. Together, they help your body produce serotonin, which relaxes the brain. Eating yogurt before bed is beneficial, but you should be careful about the serving size. If you consume large servings of yogurt before bed, it will increase the calorie intake and make you gain extra pounds. You should consume plain yogurt before bed as the body doesn’t burn all the calories you consume at night. Also, avoid flavored and sweetened yogurt. It is also a good idea to make yogurt at home, and it is pretty simple. Make sure the milk you use to make the yogurt comes from grass-fed cows and does not contain any additives. Make eating yogurt a habit, as it is really good for overall wellness, immunity, and good health. Migala, J., “10 Perfect Bedtime Snacks,” Prevention, November 14, 2014; http://www.prevention.com/health/sleep-energy/best-foods-eat-night-help-you-sleep. “Yogurt, plain, whole milk, 8 grams protein per 8 ounce Nutrition Facts & Calories,” SELF NutritionData; http://nutritiondata.self.com/facts/dairy-and-egg-products/104/2, last accessed May 24, 2017. 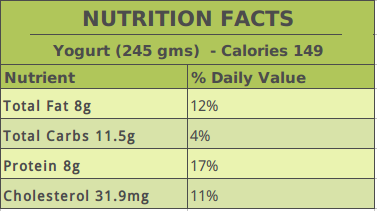 “Yogurt Nutrition,” Dairy Council of California; https://www.healthyeating.org/Milk-Dairy/Nutrients-in-Milk-Cheese-Yogurt/Yogurt-Nutrition.aspx, last accessed May 24, 2017.